Q: What do I do if my birds won’t bathe? Most birds love to bathe, but some can be reluctant to bathe when housed in a small cage. The bigger their home and the more companions that they live with seem to have an impact on their bathing habits. In watching my own flock, I believe they feel safer in numbers. There is always a “look-out” bird that remains on a high perch while the others go down to bathe. If the look-out spots anything that threatens danger it will let out a warning call and the flock will retreat to the high perches. Without the look-out, it appears that some finches will not bathe. This may be why your birds won’t bathe. Q: What other birds can I keep with my Gouldians in my mixed aviary? Gouldians are fairly docile, quiet flock birds, but just like other species, they can become territorial during breeding season. So I would suggest that until you become familiar with owning different species and their breeding habits, that you only house different species together when they are not in breeding condition. Typical species that can be housed with Gouldians in a non-breeding colony would be Owl Finches, Society Finches, Parrot Finches, Masked Grassfinches, Longtail Finches, Shafttail Finches, Canaries and various African waxbills…Cordon Bleus, Purple Grenadiers, Orange Cheek Finches, Green Singing Finches, Lavender Finches among others. You should never house Lady Gouldians with Parrot Finches during breeding season because these 2 species are closely related and will hybridize. I would also not house Gouldians with Society (Bengalese) Finches during breeding season because some Society Finches do carry diseases that will infect and kill Gouldian chicks. I would NEVER recommend housing Gouldians with Zebra Finches at any time because there are high activity finches and will stress quiet finch species like Gouldians. Q: I need to know how to make sure that my birds are getting clean water. I think that the water coming from my underground well may be contaminated? Help. You can have your well water checked by your local water or health department, but be sure that they check it for all contaminates since in most cases they only test water to the degree that the organisms that it contains will cause harm to people. If you still suspect that your birds are being adversely affected by your well water you could install a UV water filtration system in the water line coming into your home. If you install the filter BEFORE the water heater, both the hot and cold water coming from every tap in your home will be completely free of any organisms that could harm you or your birds. Another way to insure the quality of your bird’s drinking water would be to install a portable Reverse Osmosis (R/O) with a built in UV filtration system under the sink that you use to draw the water for your birds. This will provide you with cold filtered water only at that sink, but it is also a good way to give uncontaminated water to your birds. Q: I have a question on cage lighting for our Gouldians. Can we purchase full spectrum lighting at any Home Depot Store or do we have to purchase the avian bulbs? Some people say that you can go to Home Depot and purchase the daylight spectrum florescent bulbs, but others say that you need the expensive florescent bulbs that produce UVA and UVB light. Birds can see light and color in the UV spectrum of light, while we humans cannot. Therefore birds see each other differently than we see them under UV lighting conditions. If you had florescent bulbs that gave off UVA and UVB light, it is said that it would help the birds to choose a mate while viewing each other the same way they would look in nature. These UVA and UVB bulbs do not give off enough UV light to enable a bird to produce its own vitamin D. This can only be done in the presence of sunlight. Since most caged birds are housed indoors the supplement manufacturers have added vitamin D3 to all of the supplements made for birds. So as long as you are using a good vitamin/mineral supplement that contains vitamin D3, it is not necessary to purchase the expensive bulbs that give off UVA and UVB light. I personally do use the Arcadia lamps which give off the UVA and UVB light waves because I am trying to duplicate, as closely as possible, what my birds would experience if they were outdoors. Q: I will be getting my first pair of Gouldians for my birthday. Can you recommend the perfect cage for me to purchase? I’m not sure that there is a perfect cage for everyone, but I can give you some general guidelines. I believe that you should purchase the largest cage that you can afford and that you have space for in your home. A caged bird that gets plenty of quality exercise will be healthier and happier and live a much longer life than one living its life in a small cage. In my opinion the perfect length would be about 6 feet long. If you place the perches near the top and at either end of this cage the birds will get plenty of exercise flying back and forth. However they will get BETTER QUALITY exercise flying from the bottom of the cage to the upper perches. For this reason I would suggest placing the food dishes on or near the floor of the cage so that the birds have to fly back up to the perches after each meal. Be sure to place the food dishes away from any over hanging perches so that the food will not become soiled. This link http://www.birdcages.com/bird-cages/small-bird-cages/altoonadoubleflightcage.cfm?source=gbase&gbid=Altoona_Double_Flight_Cage&TID=AEC023 will take you to a photo of a cage that I really like for my own finches. This cage comes with a divider, making it easier to catch the birds when it is inserted. During the breeding season I replace the wire divider with a solid divider that I had made at a plastic fabrication shop. This allows me to use both sides as a breeding cage and keeps the pairs from seeing each other which could cause distractions to their breeding activity. Q: Why is it important to disinfect my cage after treating with S76 or Scatt for air-sac mites? In a 1995 study by P. J. Bell it was reported that non-gravid air-sac mite females will often crawl off the birds through the upper respiratory tract. They also found that the air sac mite will survive for a short time outside of the bird’s respiratory tract. For this reason, it has been recommended that the day following a treatment for air-sac mites, that you thoroughly clean the cage to rid it of insect life, not avian pathogens. This can be done by disassembling the cage and surrounding areas and thoroughly cleaning all surfaces. Or you might spray the cage and surrounding areas for any insect life that could be living in it’s cracks and crevices with a avian insect spray like AIL (Avian Insect Liquidator), Pestex or Control. Q: How long will it take after I use S76 or Scatt before I begin to see improvement in my birds infected with air-sac mites? Q: A friend of mine told me to treat my Canaries and Gouldians with Scatt or S76 as a “preventative” measure. Is this correct, and if so, how often should I do it? Treating your birds every month with S76 or every 3 months with Scatt isn’t a “preventative” from them ever becoming infested with air-sac mites. Such treatments should only be done once you know that your birds have become infested. It is a method of controlling the population of adult air-sac mites so that they never reach numbers which have the potential of suffocating the bird when they are treated once you begin seeing the typical outward symptoms of an air-sac mite infestation (clicking or wheezing sounds, coughing, sneezing, open mouth breathing or excessive beak wiping). Air-sac mites live in a symbiotic relationship with most wild Gouldians, so it should be expected that the first wild caught Gouldians that were introduced into captivity were infected and once infected it is nearly impossible to ever eradicate them completely. Since Canaries are very susceptible to this mite too, perhaps the mites were transferred from the Gouldians. I do not know if it was common for Canaries to carry air-sac mites before they were kept in close quarters with Gouldian Finches. Q: S76 says that it treats mites. Does that mean external or internal? After giving the S76 how long would you wait before administering Worm Away? S76 will kill air sac mites which are internal and it will also kill external mites that merely live on the birds if you allow the birds to bathe in it. If the external mites are ones that will bite the bird and draw blood, then they will be killed during the time that you are adding the S76 to the drinking water and it is in the bird’s bloodstream. Any external mites living or breeding in crevices off the birds will crawl back onto the birds once the S76 has dried as it does not have residual action like the avian insect spray Avian Insect Liquidator (AIL). S76 will kill some internal worms but you will have to use another worming medication like Worm Away or Worm-Out Gel to kill tape worms. You can use the wormers the next day after you treat with S76, but do not mix the 2 together in the same water. 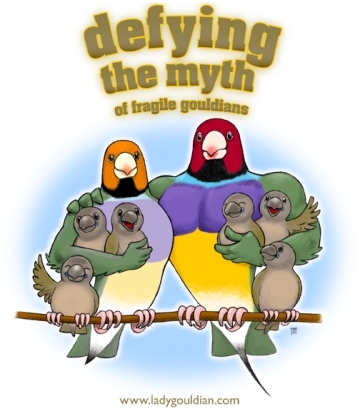 Q: I am new to the Lady Gouldian world and trying to learn as much as I can about them. I have just purchased a new pair. They were treated with S76 both in their drinking water and I also placed a drop on their skin on the back of the neck. There is no nasal discharge, no coughing, no breathing with open beak, no tail bobbing. Can I lay to rest the idea of lung mites (air-sac mites) and combine them with my other Gouldians? Before you release your new pair of Gouldians into your existing flock you will need to complete the initial treatment for S76. This means that you need to treat them for 2 consecutive days each week for 3 consecutive weeks, and thereafter you need to treat the entire flock with S76 in their drinking water for 2 consecutive days each month. Since air-sac mites are endemic in the wild population of Gouldian Finches it should be assumed that all captive Gouldians are also infected since the original wild caught birds probably had air-sac mites. Once a bird is infected with air-sac mites, it is next to impossible to ever completely eradicate them. The nymph stage of this mite is laid in the posterior air-sac by the adult female and lives there in a dormant state for a long time. There is not a product on the market that will kill this stage of the mite living in this area of the bird. During times of stress (molting and breeding season) when the birds immune system is suppressed the nymphs will mature into adults and begin the cycle again. By treating with S76 every month you will keep the adult population of mites to a minimal number and thus prevent the symptoms that you mentioned from ever being exhibited. Keeping the adult population of mites in low numbers will also prevent suffocation of your birds from many dead mites when they are regularly treated. There are other diseases that birds can carry that you should also be aware of before releasing your new birds into an existing flock situation. I always segregate new birds for a period of 2-3 months before allowing them direct contact with my flock. During this time the only treatment that they will receive is the S76 treatments for 3 weeks for air-sac mites, but I observe their droppings everyday because this is the best way, short of having culture testing of the droppings by an avian vet, to tell if there is anything else that the new birds should be treated for. When I am confident that the new birds are healthy, then I will release them into the flight cages with other birds. But be aware that there are diseases that a bird can carry that will not be evident in the droppings and you will never know that they are present no matter how long the birds are kept in quarantine as you will not see any outward symptoms. But once these diseases are transmitted to other birds, problems could develop. Such diseases would be Campylobacter and Cochlosoma that can be carried by Society Finches that will infect and kill baby Gouldian chicks, and Ornithosis that will cause breeding problems in your flock (dead in shell, infertility and a lack of a breeding response in some birds). Polyomavirus is another real concern that can be carried by finches that can infect and kill baby birds that come in contact with the carrier birds.